A Durable Power of Attorney is a legal document in which a person appoints another to act in his or her place with respect to his or her financial affairs. The power to act may be limited to specific matters or circumstances or may be so general that the agent may take any action that the principal could take without a court's intervention. Disability can arise from a number of different causes, such as illness, injury, an accident or old age. If this happens, and you have not executed a Durable Power of Attorney, then the court may decide who will act on your behalf. Known as guardianship and conservatorship proceedings, these court actions can consume time and money and leave the decision of who will handle your affairs in the hands of a judge. What are the requirements of a Durable Power of Attorney? You, as "principal," name another individual or institution as your "agent" or "attorney-in-fact" to act for you in handling your affairs. The appointment gives them the power to sign checks, make deposits, pay bills, contract for medical or other professional services, obtain insurance, sell property as well as other daily financial tasks. 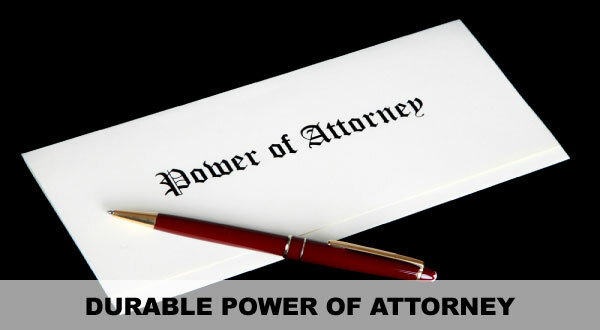 A Durable Power of Attorney should be in writing and signed in the presence of a notary public or your attorney. When does my Durable Power of Attorney become effective? Your Durable Power of Attorney can become effectively immediately upon execution, however, most times a Durable Power of Attorney is drafted to become effective upon incapacitation (you are unable to act on your own behalf). The benefit of having your Durable Power of Attorney become effective only upon disability or incapacitation is that it gives you total control of your financial affairs while you are healthy and of sound mind and body. The only time someone else can make financial decisions for you is if you become disabled or incapacitated. Your disability or incapacitation is proven through medical evidence, such as a medical report from your physician. Can I revoke a Durable Power of Attorney? Yes. You can revoke your Durable Power of Attorney as long as you have capacity. The revocation should be in writing and delivered to your "agent" or "attorney-in-fact." Also, a Durable Power of Attorney terminates at the time of your death. Who should I name as my "agent" or "attorney-in-fact?" You can name any adult (such as a spouse, child or friend), or you can name a private pay guardian (such as a bank account or accountant). It is very important to chose your agent wisely since this is the person who will be making important financial and personal decisions for you. You can name more than one agent, however, if you do so you should specify whether your agents can act independently or whether they must act jointly. Don't put off getting a Durable Power of Attorney until it is too late. Contact an experienced NJ estate planning attorney at Pinard Law, LLC without delay to make sure that your important personal and financial decisions can be made for you in the event of an accident, disability or incapacitation. Don't put your loved one through the anguish of seeking a guardian to be appointed by a court if you become incapacitated. A NJ attorney at Pinard Law, LLC will tailor a Durable Power of Attorney to fit your needs in a cost effective manner.